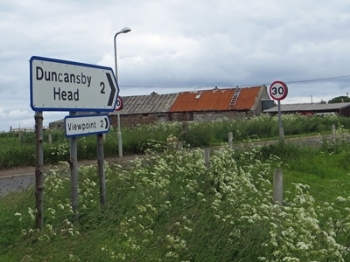 At 15:52 on Monday July 24th I finally arrived at Dunscanby Head. The journey was 3481 miles over 216 days, with nearly 440,000 feet of ascent, that's over 15 times up Everest! My journey started in March 2010 and was originally scheduled to be completed by October 2010. However after successfully completing all the counties of England and Wales; over 2,000 miles in 125 days, I ran out of energy and was advised by my doctor to rest for at least 2 months. I resumed in October to complete the Border Hills and hung up my boots for the winter at Sanquhar in South West Scotland. I set off again in March 2011 hoping to arrive at John O'Groats later that year. It was not to be, after completing Southern and Central Scotland I headed north into the Highlands and on June 2nd I climbed the high point of Argyllshire, Bidean nam Bian. On the descent I slipped crossing a small burn, fell and hit a boulder in the water. The journey came to an an abrupt halt the following day when a broken rib was diagnosed. It took 3 months before I could pick up my rucksack again, 6 weeks of complete rest to allow the bones to mend and another 6 weeks to build up my fitness levels again. At the end of August I set off again via the highest point of the journey, Ben Nevis, to the Cairngorms, the Angus Hills and north to Boat of Garten where it was time to hang up the boots again for the winter. 2012 proved to be a difficult year with family commitments and the wet and windy weather conspiring to limit the days I could spend in the hills (I had decided at the start of the year that I was going to enjoy and not endure the wonderful Highland scenery). I managed to fit in 3 trips north to make my way over the high points of Nairnshire, Ross-shire and Cromartyshire to reach Ullapool in September. The last leg through Sutherland and Caithness was planned for October but a family illness meant I had to postpone the finish into this year. Originally I planned to visit Orkney and Shetland as an appendix to the walk and cycle to their high points the following year. I have now decided to continue on from John O'Groats, by bus and ferry to complete the picture and add the remaining 2 counties of Britain to the list. Yesterday nipped over to Orkney on the ferry from Scrabster and today I climbed Ward Hill on Hoy, the high point on Orkney. 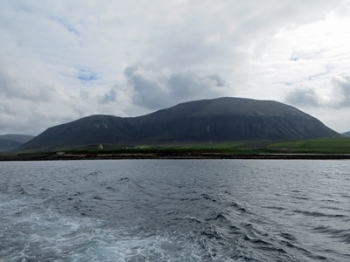 Just leaves Ronas Hill on Shetland to climb. I will spend a week on Shetland in September to complete the appendix to the journey. The last day! More easy A9 road walking to John o'Groats, then a 2km dash up a quiet lane to the lighthouse at Dunscansby Head, where I collapsed on the ground at 15:52 the journey done! Well nearly, still had to walk back to John o'Groats where I found a bed in the Seaview Hotel for my celebration pint. Last night found 1 hotel in Lybster closed and the other full so hopped on a bus to Wick where I found a bed for 2 nights. Another day of A9 walking, this time without the rucksack. A wet morning but I'd dried out by the time I got back to the hotel. 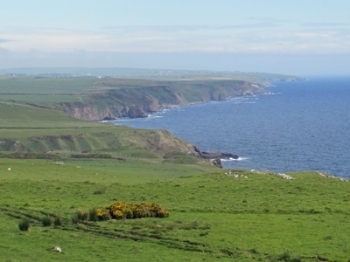 Option of walking cross county through remote inland Caithness or head back to the narrow, green, and inhabited coastal strip. As heavy rain forecast today, decided on the later and retraced my steps to Dunbeath and more road walking on the A9, dodging the cars and showers. Turned out much drier than the 5.30am forecast.